This is a 2 bedroom, 2 story (3 levels), 1250 sf (to the outside) house that was designed as a hybrid, passive solar model to demonstrate the plan elements needed to submit for review in a covenanted community. It is a compact design that incorporates many aspects of sustainable architecture, including an attached solar greenhouse, a naturally cooled pantry, and the use of some natural, local materials (earthbags and strawbales). The appearance is fairly conventional, but it does have a curved north wall, for interest and strength of structure. It should be quite energy efficient, requiring little back-up heat (provided by a wood or gas stove). Even though the square footage is small, with the three levels there is much diversity and interest inherent in the design. The upper loft area would be accessible via a separate entrance on the north side. Clerestory windows facing south bring light to the upper level rooms, and provide excellent ventilation for the entire house. 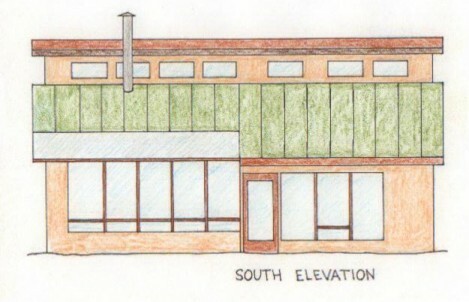 The house could be situated on a south-facing slope, or artificially bermed on the north, east and west sides. The lowest level houses the master bedroom and bathroom (including laundry facilities), as well as the bermed pantry off of the kitchen. Short flights of stairs lead to each of these facilities. Natural light for these rooms would come form glazing in the partition wall that adjoins the main level. The main level features an entrance from the south adjacent to the large greenhouse planting bed. Opposite the planter are the steps going up to the upper level and the masonry surrounding the stove or fireplace. The kitchen/dining area is on the eastern side of the main floor. For more kitchen space, a peninsula could extent opposite the bathroom areas. 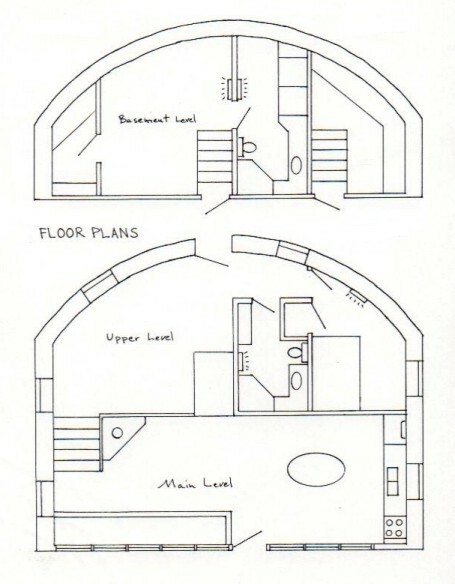 A second bedroom and bathroom are on the upper level. The bed platform is built-in over the stairwell to the pantry. The living room has a northern entry door. Built-in cabinetry is above the stairwell to the lower bedroom. A railing separates the upper level living space from the main level, giving this area an open, airy feeling. This cross section shows the hybrid nature of this design. 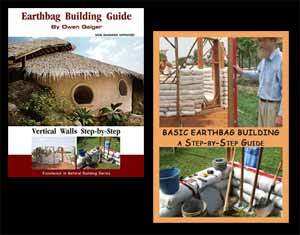 The primary exterior walls of the lower story are made with earthbags filled with insulating material. These walls on the second story, above grade, are strawbale. The rest of the structure is more common stick-frame construction. 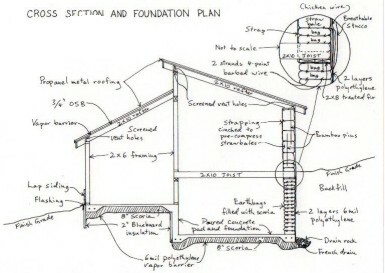 The foundation is a poured monolithic slab over insulation, providing much of the necessary thermal mass for good passive solar performance.